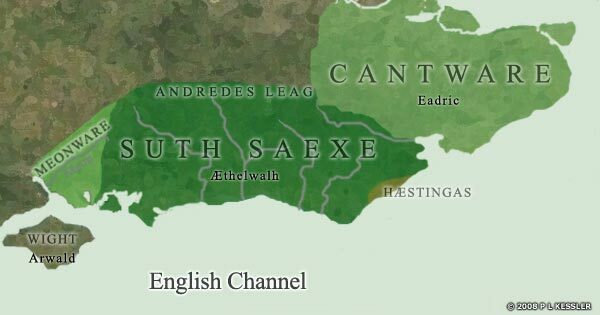 The South Saxons (Suth Saexe) had control of all of the coast nearest to the Continent. The Meonware and the Isle of Wight had been ceded to the South Saxons by Mercia in 675. Eadric was installed in Kent (Cantware) by the South Saxons in early 685. It might be postulated that it was a member of the Agnatic Witenagemot from East Sussex who supplied Eadric with an army for him to gain the Kentish throne, and such a witan is conjectured to have existed in the main text. Original text copyright © David Slaughter and the History Files. Go back, or return home.